This column grew out a discussion on my blog on the relationship between classic and preppy styles. The subject quickly became an effort to identify the real roots of American preppy and what it means today. 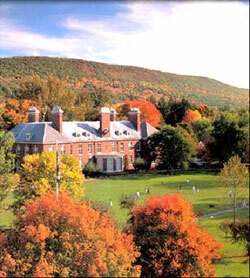 New England preparatory schools, conservative protestant values and social stratification all combined to create an environment which produced the uniform we know today as the preppy look. Actually, what passes today as “preppy” is a fantasized ideal of make believe history. It is a manufactured past that distorts the classically rooted values which gave birth to the preppy culture. When a kid is called a prep today, it usually means that he wears rugby shirts and shops at Abercrombie & Fitch (I remember when A&F was, in fact a great store). There is no sense of history or understanding of the preppy culture and that’s too bad, because it’s a pretty interesting history. Yes, it started mostly at New England prep schools and ivy walled colleges. But the roots of preppy style can also be traced to a focus on social achievement, uniformity of style, propriety, proper decorum and class distinction. Conformity of dress at school resulted in the basic uniform of coat, tie, button down shirt, grey flannels or chinos and loafers or lace ups. Codes, traditions and sports also helped to nurture a bond and familiarity among budding preps and instilled in them a feeling of belonging. This environment helped create a culture of exclusivity that had real influence. To say you prepped at Andover (a feeder school for Harvard) or Hotchkiss (a feeder school for Yale) could win you access to the right social circle or get you into really great parties. And once in the working world, to say you were a Yale man could mean getting the right job, joining the right club or vacationing on Martha’s Vineyard. As preps sought to instill that sense of tradition and lifestyle in their own children, they looked, of course, to their own preppy past. To the oak paneled lecture halls of Exeter, the squash courts of Deerfield and the rowdy but stylish nights at Choate Rosemary Hall. So their offspring were trucked off to the old alma mater and the cycle began again. But, as with so many other attempts to create a bubble of exclusivity, the prep school aesthetic eventually moved beyond its original sphere of influence. People want what they do not have or what seems more attractive than what they do. So, when the Preppy Handbook hit the shelves in 1980, its editor Lisa Birchach (herself a Brown grad) overnight became the arbitrar of all things pink and green. People didn’t care that it was intended to be both a send-up of the “true” prep culture as well as a tongue and cheek education for those looking to emulate the life. They saw a way of living that was far more exciting, cultured, sporty and stylish than their own – and they wanted it. 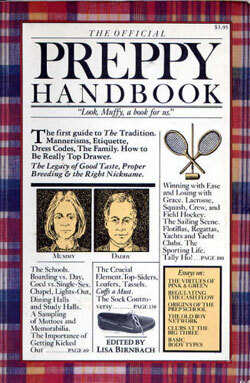 For the first time, preppy culture had been distilled into a portable and easy to understand resource. The privileged and windswept lifestyle that had taken generations of Blue Bloods to develop and refine was now a commodity to be bought and imitated. I often use the term “democratization,” to describe this moment in the life of prep. That is because once the Preppy Handbook came out, kids across the world latched onto the most attractive aspect of the preppy life: its look, the rumpled and ironic blending of dress and casual clothes. The original audience for the rebellious “foul weather gear over the blazer” look was other preppies and their families. Yet, as this type of hybrid style came into its own, it seeped out into regular society. Eventually spreading to Madison Avenue, it was popularized by style influencers like Ralph Lauren. The prep boom of the 1980s waned over time due, I think, to its extreme and vibrant interpretation of the preppy culture; there was an almost cartoonish quality to the movement. Broadly speaking, the current resurgence in preppy style has taken on a more worn, comfortable and “vintage” personality. It seems approachable and less stuffy. An interesting thing has happened to the breeding grounds of prepdom too. If you walk through Harvard Yard or Yale’s Old Campus, you don’t see too many of the snooty old-line preps anymore. They are still there of course, along with Skull & Bones and the legacy kids whose wealthy parents bought their admission. But what you really see is that a majority of the kids milling around campus these days more closely reflect the modern world. The prep thing is still very strong – stronger perhaps than in the 1980s – but it has been modernized and updated. Just like everything else in life.